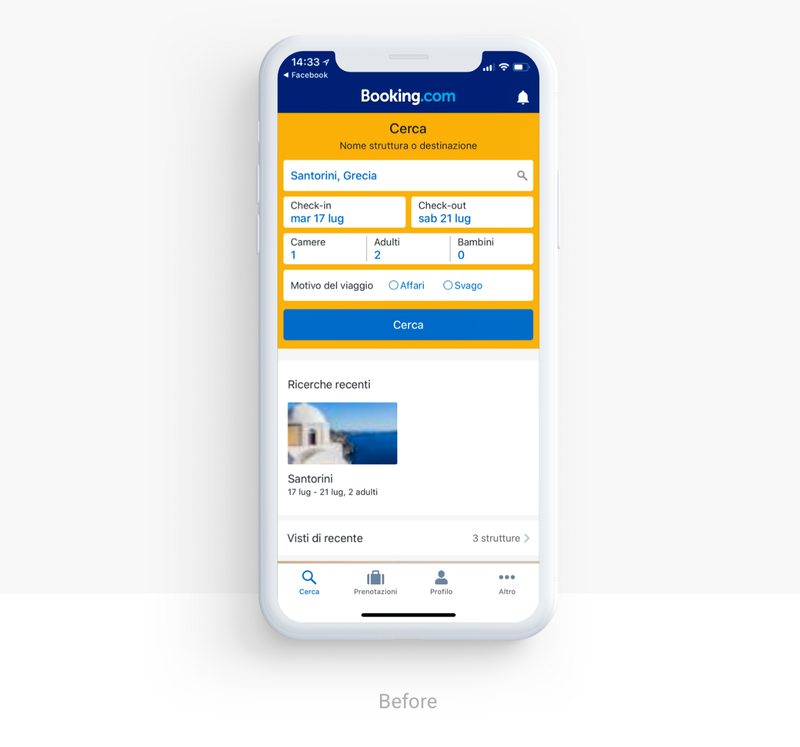 Booking.com has grown from a small Dutch start-up to one of the largest travel e-commerce companies in the world. At Booking.com, travellers are connected with the world’s largest selection of incredible places to stay, including everything from apartments, vacation homes, and family-run B&Bs to 5-star luxury resorts, tree houses and even igloos. Each day, more than 1,550,000 room nights are reserved through the platform. Whether travelling for business or leisure, customers can instantly book their ideal accommodation quickly and easily, without booking fees. Since Booking.com was launched, many competitors have followed up the trend with a similar business model, filling the marketplace, becoming popular and In few cases working even better than Booking.com itself. To begin my research, I started to look at a few competitors or similar platforms, analysing UI, UX, User flow, IA and key features. I won’t go into detail however, as I want to keep the focus on the research which has been made on Booking.com itself. Going further through the research, I identified 4 personas which have different needs and different goals. This data will be useful to improve the user experience for each one of them. 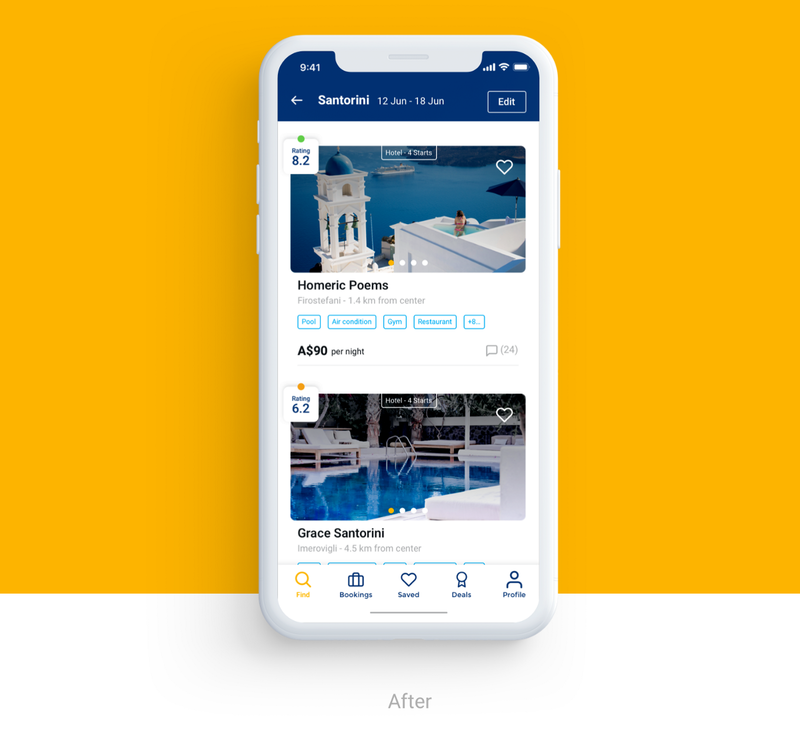 The aim would be/has been to create the best itinerary and improve the functionalities to provide the best possible experience for each persona. The most relevant is, without any doubt, the booking cancellation. Too many users noted unjustified fees or difficulties getting in touch with the hosts. I’d like to pull out one quote, which was pretty interesting because it doesn’t depart too much from the “user complaints” faced in the users reviews (deal complaints). Starting from the pain point, I tried to find solutions to solve them and introduce new features overall to improve the user experience. 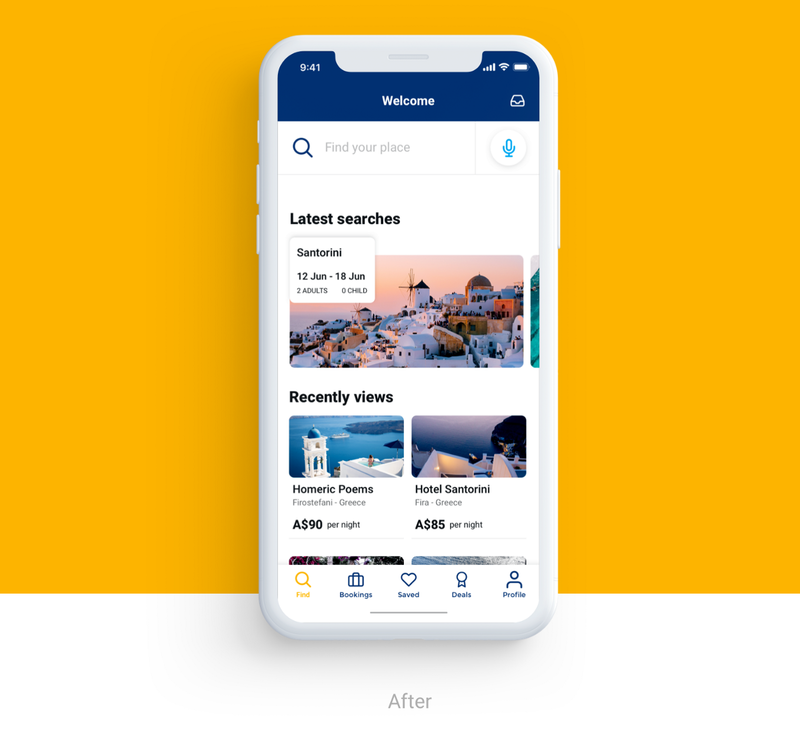 Overall, I’ve made many changes on the current homepage.The searching process has been completely redesigned, trying to avoid too much information being required to get a result in the first instance. 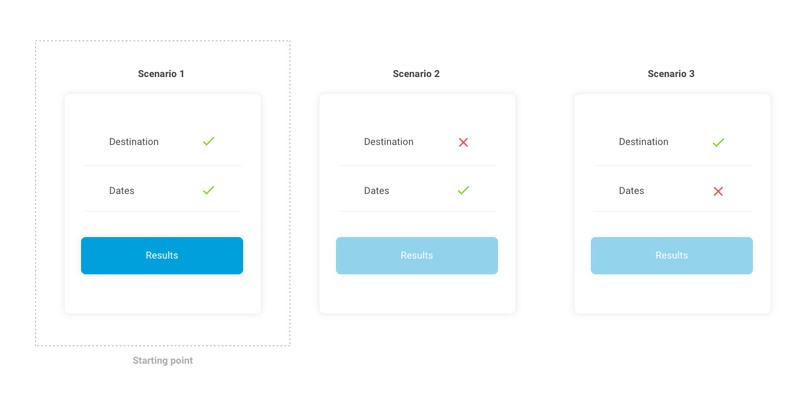 Navigation — I’ve designed a new Tab Bar, pulling out the “saved” button from the IA, so the user can quickly have the access to its own saved properties. Furthermore I introduced the new section “Deals” which I’ll explain better later. 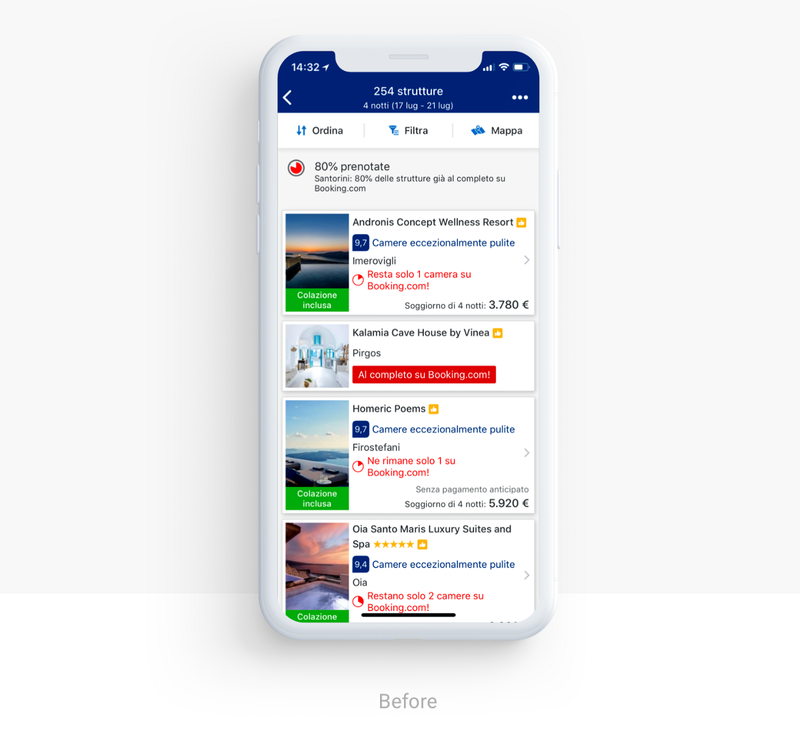 Helpful widget — As for the previous version I’ve kept the useful widgets related to the latest searches and properties view, revisiting the UI in order to improve the look and feel and the usability. Social — Nowadays, social networks are even more integrated in the user’s lifestyle. 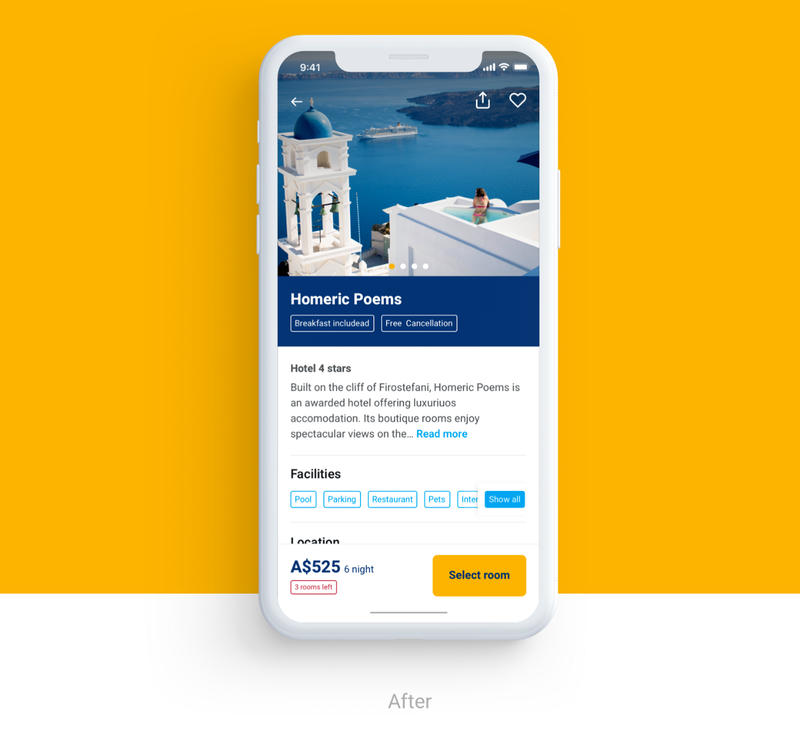 So why shouldn’t be included even in booking.com? 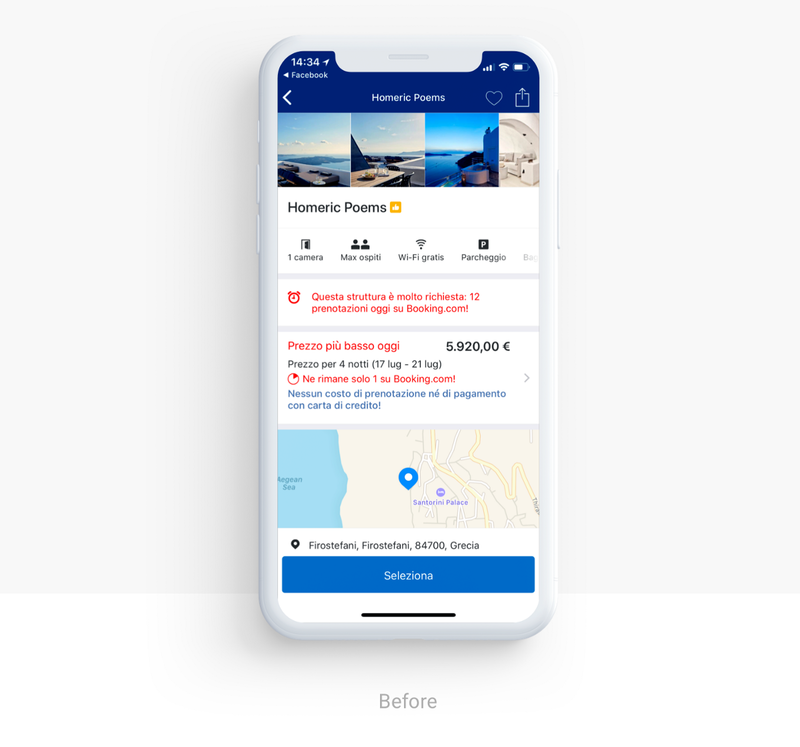 I’ve included a new feature which allows the user to connect with their own networks and to see the latest properties chosen by them, including some quick feedback about it (i.e. like / dislike). I’ve relegated this feature to the homepage as I want to collect more data about it before rolling it out across other sections. Note: Even the facilities highlighted in the listing page will be shown based on these assumptions. The main facilities offered by the property have been shown to the user In a first instance. 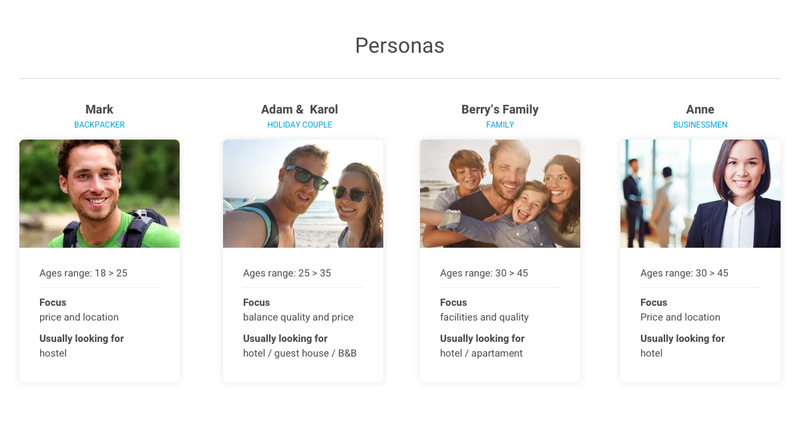 Note: Leveraging the personas data, the property listing can be customised to highlight relevant information which each persona is looking for. I’ve rolled out many changes which can be introduced in the listing page.In this case the price has been shown by total, to avoid to hide potential additional fees which might affect the total price. 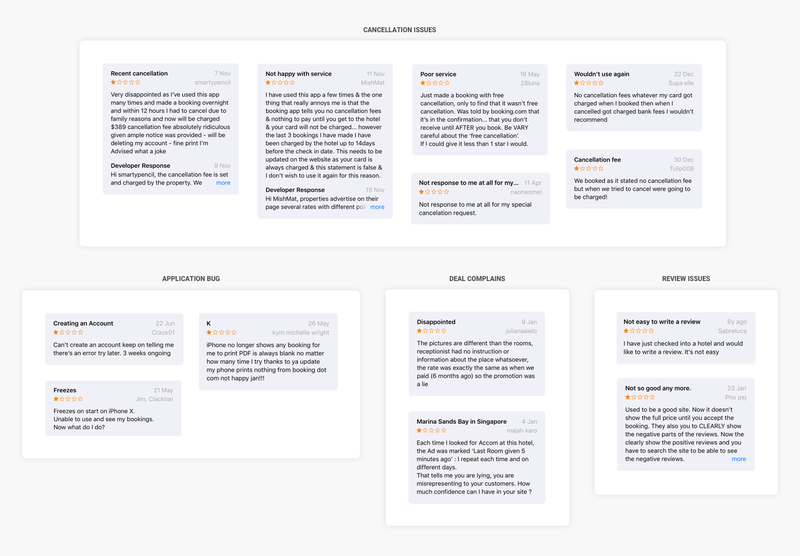 I’d also like to highlight a minor feature related to the reviews, in which the user has been allowed to filter them by rating (sort by button). — This issue was spotted in the user reviews. I built a prototype which shows the entire project, showing each one of the mockups faced before. Due to time constraints, the research and consequents assumptions are based on my personal experience and a small amount of data. Deep analysis and additional testing needs to be conducted in order to refine and validate the solution.